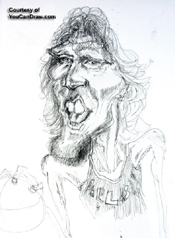 What Makes a Face Caricaturable? 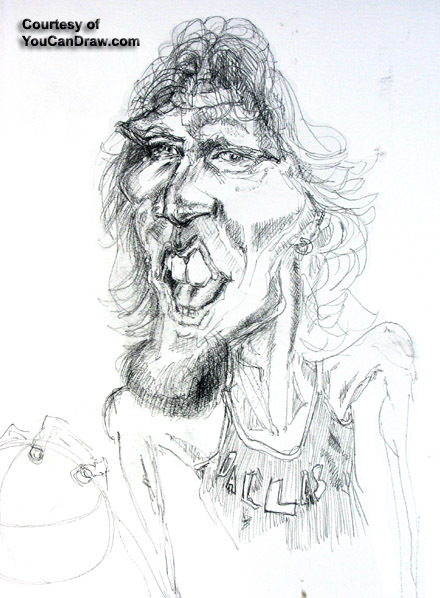 What makes Dallas Maverick basketball star Dirk Novitski caricaturable? That's this issues question :-) ...lets jump right in! 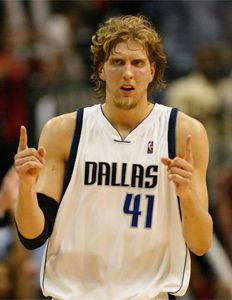 Anyway, today's caricature - if you didn't gather by now - is of Mr. Dirk. 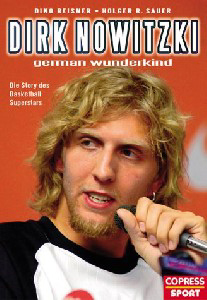 He's a national hero in Germany and after sifting my way through the web pix, seems like a real fun-loving guy too. Let's get right down to it. Blonde locks. Yep he's got hair. All over the place. Though this seems new (for him) in the last couple years, it's become a trademark. On a guy this gangly and tall, I like to narrow the top of the head and so tighten up the hair on top as well. Remember when you're drawing hair, it's darkest in these places: next to the face, next to the head, at the bottom of any locks - if light is coming from the top, usually on the inside of tight curls, and in areas where it overlaps underlying curls. Notice the curls and their highlights / shadows: where hair is closest to the head, it's darkest. 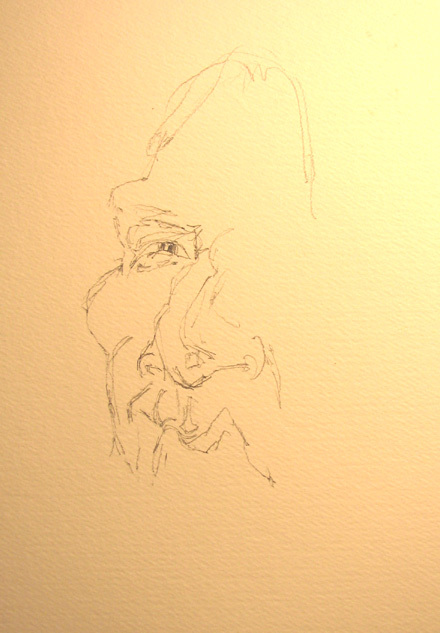 Also notice the overall shape of the curls within the overall outline of the hair: shapes within shapes. See the shapes and edges first. Then worry about the shading / shadow / highlights. Bony brow. A lot of really tall guys get this very bony face - especially bony brows. In the case of a lot of really tall guys the question comes up about the presence of Acromegaly: a condition where you just grow your behind off. Someone once quipped "pro basketball is a sport where the court is worn out by a bunch of pituitary cases". There's some truth to that. 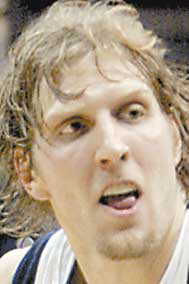 I don't know if that's Dirks situation or if he's just naturally huge. The really bony brow, big broad cheek bones all can be signs of it (along with huge hands, feet and other things). I won't pretend I'm his doctor. Deep set eyes. Check out the deep set eyes. What might set off a strong bony brow more than deep set eyes? Question: How do you make those deep set eyes? Answer: By making the darkest shadow and the lightest highlight contrast each other in very close proximity - with a strip of a middle tone between them. Look at the photo above: the darkest part of the photo is in and around the eyes. The brightest highlights are on the cheeks -- and on the bony brow over the eyes. See how that proximity of light and dark (i.e. contrast) makes for really deep set eyes? Squint to make this clearer. Also notice the middle tone between these two extremes? The eye brows (the actual hairs of the eyebrows) make up this transition zone. Painters often use a very similar principle but with color: put two bright complimentary colors directly adjacent to each other. Your eye will immediately be pulled to that area. (Complimentary colors? Orange and blue are compliments, as are red and green or yellow and purple, etc. - they're colors opposite each other on the color wheel. 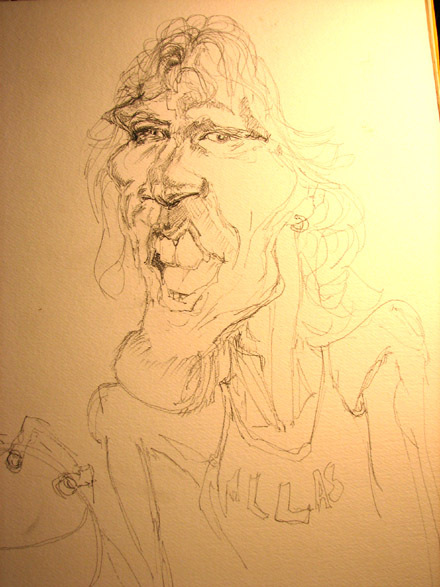 But you don't need to know that to draw caricatures :-). Big choppers. That's what you see in this picture. 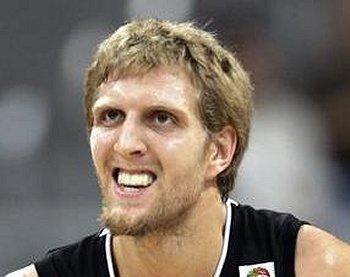 I noticed it during the NBA finals too: Dirk flashes those teeth in the heat of competition and they become a real noticeable thing to exaggerate (in my way of thinking anyway). 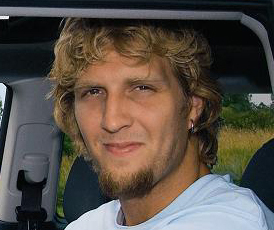 Here's an older picture that shows the medium long hair and the growing chin hair. But you also get the sense of the strong bony brow over the eyes, the deep set eyes, broad cheekbones and the narrow "apron of the upper lip". (The "apron of the upper lip" is the skin that covers the upper teeth between the bottom and sides of the nose and spreads out like, well, an apron on it's way down to transition into the upper lip). Twice as wide as that! (Shoulders that stretch from here to St. Louis). I was going to chronicle each step but the light was so bad and the setting on the camera was "manual" - so I didn't realize how dark the pix were getting. I salvaged these next two steps in Photoshop (using several series of brightness, contrast and "multiply layers"...for those of you who use Photoshop to touch-up photos). Well that's all for now folks. Keep chipping away: make a regular practice of drawing (a minimum of 15 minutes 4 or 5 days a week will truly get you in the groove!). Have a great 4th of July weekend (you USA folks), a great Summer elsewhere in the Northern Hemisphere and a cozy Winter in the Summer Hemisphere!